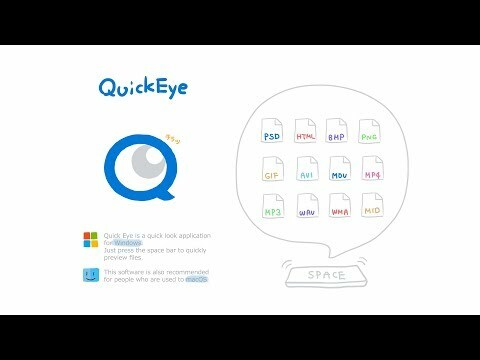 Quick Eye is a quick look application for Windows. Quick Eye supports many different file types including image, video, audio, and text files. In addition to the embedded Windows preview handler and Quick Eye's original preview functions, you can add more supported formats by loading the Susie Plug-in (both 32-Bit and 64-Bit). Support compressed files ZIP, 7z, RAR, and more. It is possible to view multiple files at once using Quick Eye. Quick Eye displays text, markup, and source code in different colors according to the category of terms. Customize Quick Eye according to your preferences with the optional settings. Quick Eye for Windows 7 / 8.1 is offered as Freeware and can be used for free without limitations. Quick Eye for Windows 10 is a Shareware program and can be used for FREE without functionality limitations. To remove the Nag screen you need to purchase a license. Quick Eye was added by RemovedUser in Nov 2017 and the latest update was made in Nov 2017. The list of alternatives was updated Nov 2018 There is a history of all activites on Quick Eye in our Activity Log. It's possible to update the information on Quick Eye or report it as discontinued, duplicated or spam. We want more alternatives to Quick Eye. Feel free to add any alternative that you know of, or ask your friends on Twitter or Facebook if they can help out. Alternatives to Quick Eye for Windows, Software as a Service (SaaS), Mac, Linux, Web and more. Filter by license to discover only free or Open Source alternatives. This list contains a total of apps similar to Quick Eye. No reviews yet for Quick Eye, want to be first? Maybe you want to be the first to submit a comment about Quick Eye? Just click the button up to your right!